The easiest way to ensure you have strong passwords for each of your accounts is to let Dashlane create them for you. Every time you create an account online or simply update a password, you can choose to have Dashlane automatically generate one for you and save the new password in Dashlane for that account. You can also use the Password Generator to produce passwords to specific standards of length and complexity, and use these instead. Finally, you can use Password Changer to quickly and automatically change the passwords for one or even all compatible websites in your Vault. You can use Dashlane to create and store secure, unique passwords for every account you have. Simply navigate to a website, and click in the new password field when you register or update your password. Click the button to Generate Strong Password. This will generate a new strong, randomly-generated password. Do not forget to save the new password into Dashlane! You will see a pop-up window, and you need to click on Save if you're creating an account, or Replace if you're updating an existing password. For more information on how to edit or delete the password you just saved, see How to edit or delete a credential. You can generate a custom password using the Password Generator, available in the Dashlane app on desktop or mobile, or directly within the Dashlane browser extension. The Password Generator allows you to randomly generate new passwords, adjust their length, if they use letters and if any are uppercase, numbers, symbols, and if you wish to avoid ambiguous characters (for example a lower case "l" and the number "1"). In the app on desktop and iOS, go to Tools > Password Generator. On Android, the Password Generator is under Tools in the main application menu. In your browser, click on the impala to open your extension menu and select the Generator. Once you have generated the password you need, you can click Copy password and paste it where you need it. Password Changer allows you to change multiple passwords automatically in one click from the Dashlane app. For more information about the feature, read What is Password Changer and how does it work? Then learn more about how to use it on desktop here, and on iOS here. The Password Changer feature is currently available on Windows, Mac, and iOS. 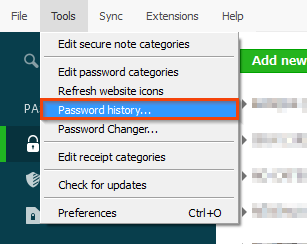 You can always view the passwords previously generated by Dashlane by going to Tools > Password History in the Dashlane application. Note that this feature is currently only available on desktop devices. For more information, see Finding any password that Dashlane generated on a website. Close all your Internet Explorer windows. Open a window in a Mozilla Firefox or Google Chrome Browser and then open the Dashlane extension. Go in the "#a*" tab and set there the settings you would like to have in Internet Explorer. Click on "use as Defaults" and close the browser. Your new settings will now be running on Internet Explorer too!